Clea's Cave: Now, That's Just WRONG! i've always leaned toward the allies-had-to-try-ANYthing opinion about the Second World War. But there's always a limit. 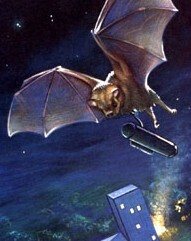 Via Gizmodo, here is an incredibly detailed plan to use live bats as bombers during WWII! Poor little guys ... but they got the desperate humans back. They managed to burn down a new air base in New Mexico before the plan was scrapped. Really.